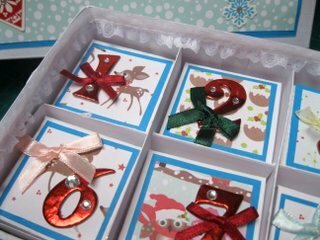 This Advent Calendar Tutorial creates an inexpensive gift that is so unique and very easy to make. Your children will be so delighted with it they won't want to share. And because they are so easy to do why not make them one for all of them to keep to themselves and then they won't need to. This is such a pretty project to make and you can fill each of the the small boxes with anything you wish. Chocolates or sweeties for the children, of maybe a small toy if you don't want your children to have too much sweet stuff. This short video will show you how to get the look for your own creation, and then you can dress it up any way you wish. 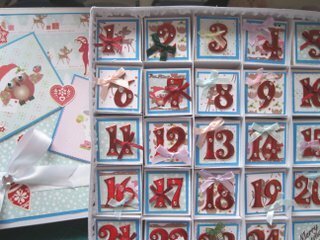 The pictured box is one I made for children and I have filled it with chocolates for them to open on each day in December. For the larger outside box I have used a 16" Centura Pearl card from Crafters Companion. 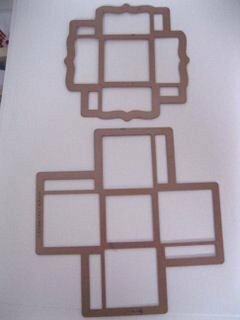 It has a lovely sheen to it and the larger card size means I can make bigger boxes for any of my projects. To the inside rim of each of these boxes I have carefully decorated it with lace and used a hot glue gun to keep it in place. Each of the numbers has a gemstone and a tiny ribbon bow attached to it. But this is the one in the Advent Calendar Tutorial that I did not complete. Or maybe small pieces of jewellery of even perfume. But what ever you decide to fill yours with I am sure that it will appreciated for the beautiful gift that it is. Each one has been glittered and then add to a different shape from the smallest dies in several of my Spellbinders die sets.